Boston Ballistic Hot Sauce is a hot pepper sauce company located just 40 minutes south of Boston, Massachusetts. Using only fresh, pesticide-free peppers from Puckerbutt Pepper Company and "Smokin' Ed Curry," our sauce is a perfect compliment to many of your dishes! Please visit our Recipes tab to find out some great ideas for using our sauce! 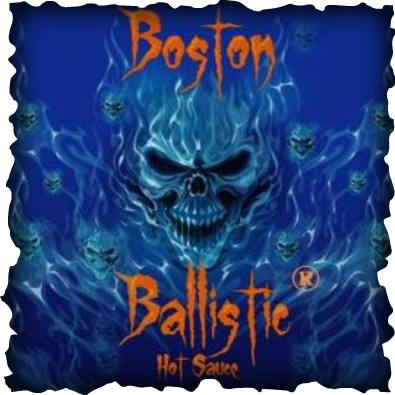 Boston Ballistic Hot Sauce ("BBHS") was founded by David Flipp of West Bridgewater, MA and is owned and operated by David Flipp and Kathleen ﻿n nnnWilliams, both of West Bridgewater, MA. Kathleen works full time as VP & Director of Administrative Services for a small real estate investment/asset management company located in Boston, MA. With her business, marketing and legal knowledge, she uses her nights and weekends to focus on BBHS.